Last night, I had cookies for dinner. One of the best perks about being an adult – allowing yourself to have dessert for dinner! Life is too short to not enjoy every meal. The truth is, my roommate Brian and I stuffed ourselves with sushi at lunch, and I had absolutely no room for dinner in the evening. However, I always have room for cookies. 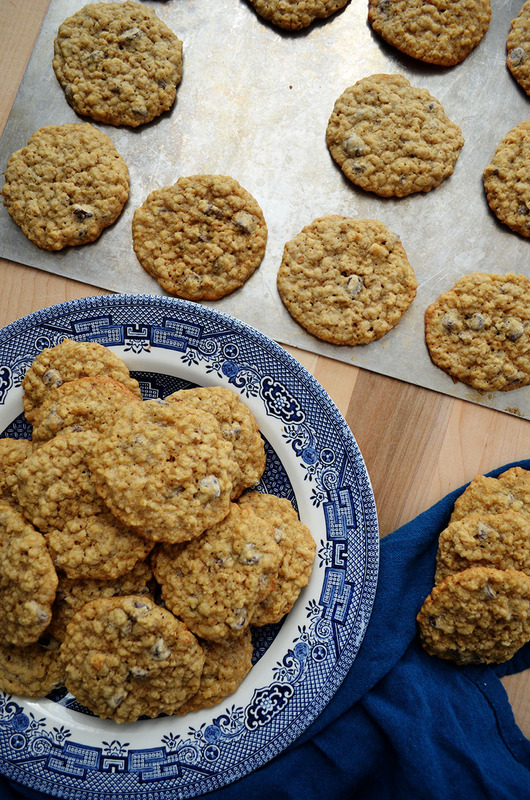 I have extra room for warm, chewy oatmeal chocolate chip cookies. 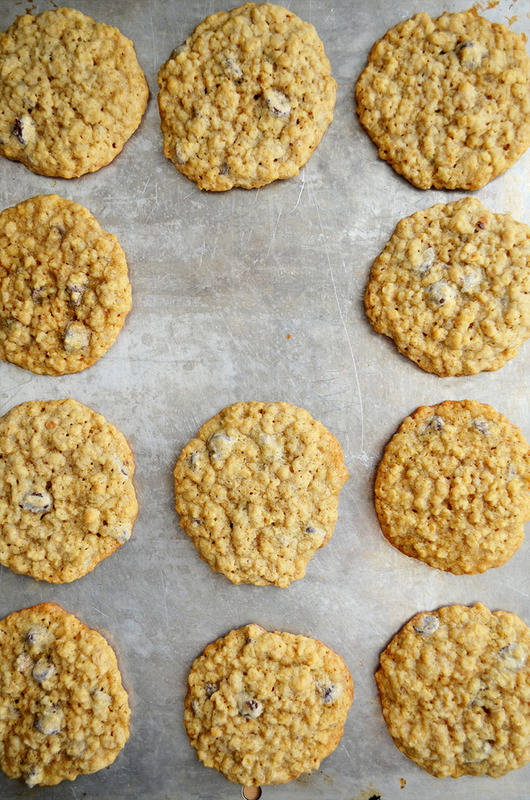 The first step in almost all cookie recipes is to cream the butter and sugar(s). The butter should be mostly soft before you can cream it. Plan ahead, and leave your butter out at room temperature for one to two hours before you start baking. Alternatively, you can microwave the butter for 20 seconds if you’re on a time crunch. The former is the preferred method. For this baking session, I left my butter out and allowed it to soften for a few hours. It was the perfect consistency when it came time to prepare the cookie dough. Everything was going just fine, until I added the eggs. I left the Kitchen Aid on low speed while I cracked the eggs in. After cracking the second egg, I lost grip on its shell, and half the shell fell into the mixing bowl. My sad attempt to salvage it was foiled because instead of turning it off, I accidentally flipped it in the other direction which cranked the speed all the way up. The eggshell became completely incorporated into the mixture. Because I wasn’t interested in having all that extra calcium in my cookies (that’s what milk is for! ), I had to scrap that batch and start over. There was no time to wait for the butter to soften, so into the microwave it went. Fortunately, four eggs, two cups of butter, and many cups of sugar later, I ended up with the best oatmeal chocolate chip cookies ever. With an electric mixer, cream the butter and sugars on medium speed until smooth. On low speed, add the vanilla extract and eggs, one at a time. Add the flour, quick-cooking oats, baking soda, and salt. Mix on medium speed until just incorporated. Stir in the chocolate chips with a spatula or large spoon. Bake for 10-12 minutes. Cool for 10 minutes before transferring. Yum! 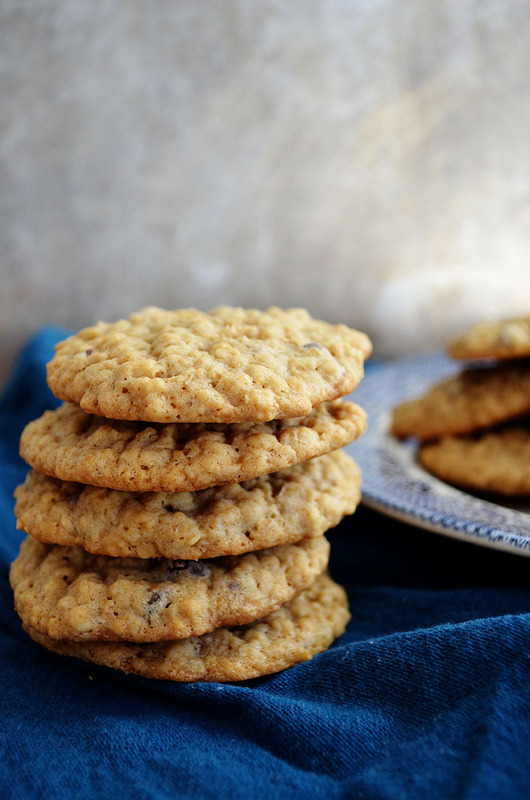 These look so good, perfect pairing with milk or soy milk! I too always have a special compartment in my stomach reserved for cookies and everything dessert! Thank you Sarah! My special compartment for desserts defies the laws of physics…no matter how much I stuff it, it never gets full! This looks like a perfectly acceptable dinner. It DOES have oatmeal in it after all! We should plan a get together now that I’m back on the east coast! It makes me happy that we’re often on the same page! And I would LOVE to meet you in person soon!! Maybe sometime after Thanksgiving? (: Looking so forward to it!